Clara Oswald is a character appearing in 21304 Doctor Who And Companions. Clara Oswald has a long brown hairpiece, alike the Scarlet Witch's, that runs down the left of her face. Her light nougat head has thin black eyebrows, black eyes, and dark nougat lips. 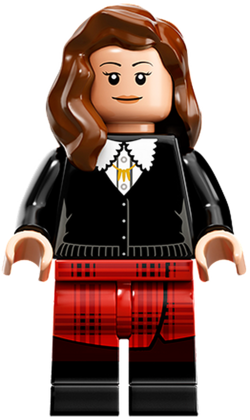 The minifigure's torso is a black sweater that has a white fluffy collar, white buttons that run down the middle, a button-up shirt underneath, and a golden necklace. On the back of the torso, printing consists of a continuation of the bottom frill and the grey curve marks that are also seen on the front. The sleeves of the sweater continue onto the black arms that end with light nougat hands. Clara's legs depict a red plaid skirt and black shoes. The skirt begins on the dark red hip piece, with printing on the front, and is continued on the double-molded legs where the plaid pattern is expanded. Underneath, a maroon area separates the skirt from the shoes, which are black without printing and are seen around their respective legs entirely. Clara's outfit is based upon what the character wore in the final Eleventh Doctor story, "The Time of the Doctor" and its immediate follow-up, "Deep Breath", the first full-length story featuring the Twelfth Doctor. Clara Oswald was a companion to the 11th and 12th Doctors. Clara was voiced Jenna Coleman in LEGO Dimensions, who reprised her role from Doctor Who. This page was last edited on 11 October 2016, at 22:29.